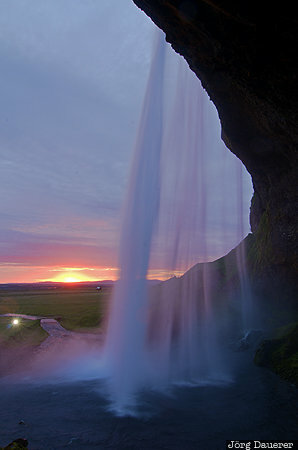 The waterfall Seljalandsfoss back-lit by the setting midnight sun seen from behind the waterfall. The motion of the water is made visible by choosing a long exposure time. Seljalandsfoss is in Suðurland in the south of Iceland. This photo was taken in the evening of a sunny day in June of 2012. This photo was taken with a digital camera.